The Filipino today remembered the most important day for the Philippines as one regular holiday and not as the 'Day of Freedom,' but I think not all. Many Filipino are very patriotic even they're outside the country. President Benigno Aquino III signed the PROCLAMATION NO. 655 that declared the REGULAR HOLIDAYS, SPECIAL (NON-WORKING) DAYS, and SPECIAL HOLIDAY (FOR ALL SCHOOLS) for the year 2014. NATIONAL HISTORICAL COMMISSION OF THE PHILIPPINES (NHCP). The Independence Day will be held at Rizal National Monument, Rizal Park, Manila and to the Plaza Quince Martires, Naga City. But if you can't make to go from any of the said two places above, you can still celebrate it by your Family and Friends. The National Independence Day is celebrated nationwide. 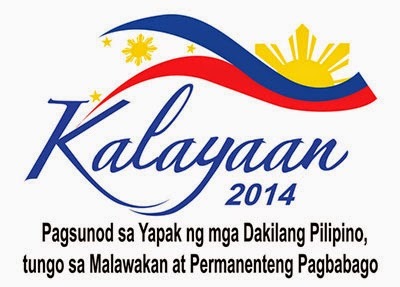 Comments or suggestions about "Araw ng Kalayaan, June 12, 2014 as Regular Holiday" is important to us, you may share it by using the comment box below.